(Turkey Vulture or Buzzard (Cathartes aura) - 01) The turkey vulture is sometimes referred to as a "turkey buzzard". 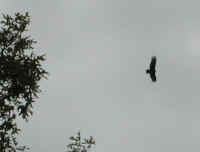 This turkey vulture soared gracefully above our heads as we were on one of our autumn walks. (Turkey Vulture or Buzzard (Cathartes aura) - 02) The magnificent soaring raptor does not kill other animals to eat. It dines on carrion, the dead bodies of other animals. God has so designed this bird, that it is immune to the diseases usually associated with decaying flesh. 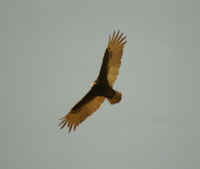 In this sense, the turkey vulture is one of nature's undertakers. (Turkey Vulture or Buzzard (Cathartes aura) - 03) This turkey vulture caught a thermal and glided upon its uplifting air currents in seemingly effortless circles. (Turkey Vulture or Buzzard (Cathartes aura) - 04) As we watched, the turkey vulture continued to climb upon the thermals, banking his or her wings to remain in the uplifting air. (Turkey Vulture or Buzzard (Cathartes aura) - 05) The whole time we watched this turkey vulture circle in this thermal, we didn't see him or her flap a wing. (Turkey Vulture or Buzzard (Cathartes aura) - 07) ...and having not found a meal, this turkey vulture headed off to look elsewhere, and find another thermal upon which to glide.